So what do I mean by "online image maker"? In the context of this post, I mean a website that will generate an image for kids. I'm not including the comic editors, most of the image editors, or the websites that allow users to "draw" online. There are two ways of looking at image makers: as gimmicks, or someday, as just what you or your kids may want to illustrate a point or form part of a presentation. Customizing an image maker means you can insert your own text, refining the image to suit your purpose. 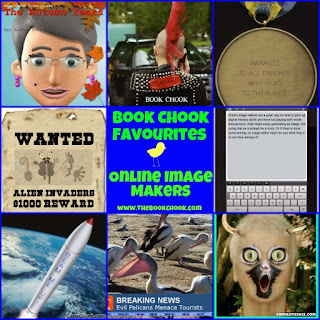 Image makers make a great way to introduce aspects of visual and digital literacy to kids. They need to work out how to use each tool, think about what they want to communicate to an audience, and how to get the result they want. Some websites may offer image makers that can be manipulated to produce results not suited to children - this is a great opportunity for parents to discuss internet safety with their kids. Here are some websites I've collected as "image makers". While I've tried to ensure these sites are suitable for kids, there are no guarantees. If you know of others, I'd love you to add them in comments. How can we use such online image makers with kids? In the group above, the image makers could be useful for the Olympic Games (medal), a wedding between book characters (wedding), a poster to encourage people to use free libraries (receipt), a setting in a story (road sign), or creating "prescriptions" for a healthy lifestyle, a happy life, an enjoyable book etc. There are more customisable sign generators at Atom Smasher. Thanks to TL David Strempel for this suggestion. Wigflip has several image makers, including a sticky note maker which I told you about in Children's Writing - the Power of Sticky Notes. Kids can also add speech bubbles to images, make animations, create posters and create tiny tags at Wigflip. Big Huge Labs is one of the biggest and best websites where we can edit rather than generate images. That means kids must either upload an image from a computer or link to a Flickr or Facebook account. There is a range of options, and most allow you to customise your photo so it results in a new image. Sometimes, you need to tweak and try again if you're not happy with a result. Options I like are Magazine Cover, Motivator (a poster maker), PopArt Poster, Trading Card, Billboard. There are so many more! Red Kid has a stack of images kids can add text to. There are different characters with editable speech bubbles, like Dr Seuss. There are fortune cookies, iPads, lots of signs, even a Punk Rock Jacket Generator - in fact plenty to explore and play with. At imagegenerator.net, kids can add text to a speech bubble coming from Dumbledore, Napoleon, ex-President Bush, and others. I must repeat my warning here to use supervision with your kids. Very similar to the one above, at hetemeel.com, children can generate an image with their own text superimposed on a picture of Einstein writing on a blackboard, an Uncle Sam poster, a dictionary entry and more. Lots of the online image editors have interesting features. For most, children will need to have an image of their own which they upload to the website. I'm choosing two I like for their special options. Tuxpi is a big online image editor I told you about in Tuxpi - 42 Photo Effects and Picture Frames. Among its editing options is one called Photomontages, Fun & Art, where you can find things like a Wanted Poster, TV Newscast etc. Kids DO need to have an image somewhere on their computers to upload for these features. You can see my TV Newscast example above with the evil pelicans. In it, I had the option to add text and save the image to my computer. Pizap is another very useful online image editor kids can use (with supervision, as always). I told you about it in Play with Words and Images at Pizap. It has a huge range of features, and kids DON'T need a photo to start with. They can choose a background, and add their choice of stickers, effects and text to it to generate an image. Great for story prompts, or just for fun. PicassoHead: At this website, children can create their own Picasso-style images. Warning Sign Generator: Kids can add text and symbols to customise warning signs. Word Clouds are image makers too. Websites like Wordle, Tagxedo and ABCya Word Cloud generate an image of words. The avatar makers count as image makers. I used ThingLink to embed some avatar makers I like in Fun with Avatars. Scroll your mouse over the collage image at the bottom of that post and you can link to each individual avatar maker! Fun and Easy Ways to Make Digital Art with Kids.